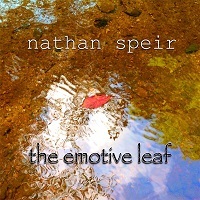 Like a breath of fresh air in a stagnant world, pianist and composer Nathan Speir offers up his double album, The Emotive Leaf. Following in the tracks of noted pianists such as David Lanz, Heidi Breyer and others, Nathan gives us two discs of the same compositions, one with solo piano and the other with light ensemble, and both are remarkable. Although this 21-track album presents contemporary music at its finest, there are roots of classical music secreted in the compositions. The music exudes a gentle passion that is strong for its melody, yet intricate in its design. On the ensemble pieces, Nathan played all the instruments making him a talented multi-instrumentalist, but he is an equally talented solo player. Nathan Speir's musical biography dates back less than ten years, but he has been playing and creating music since he was twelve years old. He has degrees from Palm Beach Atlantic University in Florida and he produced his first album, Between Earth and Sky, back in 2006. He has released several more albums and after listening to The Emotive Leaf, it was obvious to me that his dreams have been his muse all his life. Mindfulness of Your Pain is a beautiful ambient tune featuring delicate flute and placid piano. It is a reminder of the pain of the earth as we continue to ignore her (him) and damage her on every level. How many millennia did it take the planet to establish ecological balance, only to have it tilted in a few hundred years? A synthesized background wafts behind the tune A Little Fear and the tune is a bit stormy. It has a blustery melody replete with wind and rain with just a touch of darkness. I could feel my umbrella collapse and the rain dampened my clothing. Home seemed so far away and that was my greatest fear, not reaching home. Telescopic is an elaborate tune full of mysterious nuances. Doors unopened, questions unanswered and emotions undiscovered are found in the notes of this cascading melody. The tune is sparkling in tone and furtive in structure. Sometimes in life we look through the wrong end of the telescope and become confused. This is the time to turn things around. I hear influences of Erik Satie in the music whether it is intentional or not, especially on the title tune The Emotive Leaf. It has that drifting, dawdling movement to it that gives me a sense of an unhurried journey. What the music does is set me at ease, relaxing me and making me receptive to thoughts and emotions that are just on the edge of consciousness. For some reason I felt that the ensemble version had more movement, as if I was walking and the scenery came over the horizon rather than me drifting in a tiny boat along a river. Strangely, both songs reminded me of a 1960s film called Paddle to the Sea, based on a book by Bill Mason. The echoing tune Ambition is slower than I thought it would be. It is as if the mood is more pensive, but it does not lack drive. It just seems even-tempered, unhurried and focused. It has a beginning and an end, a destination sought and a goal achieved. Where No Words Can Reach starts in a minimalist tone, but gathers momentum. It has a somber tone, perhaps representing a place in the psyche that cannot be accessed by mere words. Sometimes complex ideas and thoughts have a language of their own. Nathan proposes that music might be the key that unlocks this door. The album takes a brighter turn with the final cut called Dreaming As It Should Be. There are elements of the East in the mix, but it does not overpower the main theme. It is sunny and light hearted, a fitting end to the album of serious emotion and thought provoking themes. Bonus track: Bicycle is the longest cut on the album at over six minutes. It is a musical journey really, a trip that took two human-powered wheels and lots of carefree days to chronical. As the landscape goes by, the mind takes the snapshots that later will become stories and then change into vivid memories. Nathan Speir is on the right track for composing music that delights and inspires. The emotive leaf that spiraled gently from that old tree in the front yard in late autumn keeps going even after the cold wind of winter blows into next spring. Highly Recommended.